So I was going to let the previous post stay up all day, but I came across this post on Animal NY and had to put it up for the West Coast readers out there. 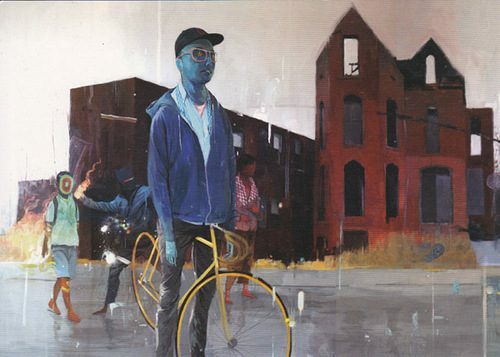 Andrew Hem is having a solo exhibition in January at Culver City’s LeBasse Projects. His work is heavily influenced by LA graffiti / street lifestyle and the time he spent in Cambodia. The blank stare of this track bike rider as people ignite and throw Molotov cocktails in the background is just one example of his work. Check out the rest at Animal NY. Be sure to ride out to the opening party for “One Leads to Another”, January 16, 2010 at the LeBasse Projects in Culver City, California.